The Hard Time oil tank from Crime Scene Choppers features deep cooling fins on the ends and utilizes a stock Harley drop-in filter element for an ultra clean look. 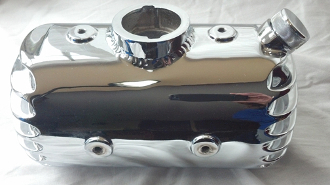 The tank holds 4.5 quarts, and features internal vent and return lines for an ultra-clean installation. The tank has a fine satin finish, perfect for painting. The tank comes complete with mounts, fill cap, drain plug, and hose fitting. Web only specail comes with the start up kit that includes filter, cap, and 4 vibration bushings (CSC-601). This item measures approximately 11.5" wide X 6.0" deep X 7.5" high.